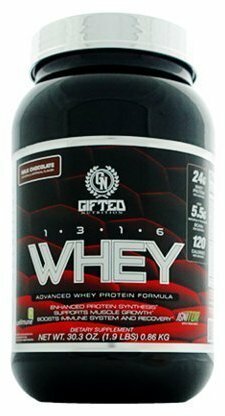 Dairy Protein Blend (Whey Protein Isolate, Whey Protein Concentrate, Hydrolyzed Whey Protein), Cocoa Powder (Processed with Alkali), Natural and Artificial Flavors, Sucralose, Acesulfame Potassium, Sunflower Lecithin (emulsifier). Mix one scoop of Gifted Nutrition 1316™ to 8 oz of cold water, almond milk or skim milk of mix two scoops with 14oz of cold water, almond milk or skim milk in a glass, shaker cup or blender. You may adjust the liquid you use to prepare to get a thicker or thinner shake. For a richer taste, reduce liquid to 4-6 oz for 1 scoop or 10-12 oz for 2 scoops. Use between major meals or after exercise. Always consult a medical doctor before using this or any dietary supplement or starting an exercise training program. Do not use if pregnant or nursing. Discontinue use and consult a medical doctor if you experience unusual symptoms. Do not use if packaging has been tampered with. KEEP OUT OF REACH OF CHILDREN. Dairy Protein Blend (Whey Protein Isolate, Whey Protein Concentrate, Hydrolyzed Whey Protein), Peanut Flour, Natural and Artificial Flavors, Salt, Sucralose, Acesulfame Potassium, Sunflower Lecithin (emulsifier). Contains Milk Ingredients. This product was made in a facility that also processes egg, soybeans, peanuts, tree nuts, fish/crustaceans/shellfish oils and wheat products. Dairy Protein Blend (Whey Protein Isolate, Whey Protein Concentrate, Hydrolyzed Whey Protein), Natural and Artificial Flavors, Sucralose, Acesulfame Potassium, Sunflower Lecithin (emulsifier). This premium whey protein formula assists in boosting immune system and recovery, and helps to enhance protein synthesis..
Wellmune is a natural supplement ingredient that is clinically proven to help strengthen your immune system and speed up system recovery system in the critical post workout phase. This unique ingredient powers the ability of Gifted Nutrition 1316 Whey to help athletes stay healthy before and after intense workouts.